This unit was taken at North Fond Du Lac, WI at Shops Yard. This switcher is held locally for switching the Car Shop. This Site is best viewed with Explorer 4.0 or better with a 17+" color monitor in 16-bit+ color. Due to the fact that this website also serves as my personal photo album. I will be adding photos often to new and different railroads. Please return often and also sign the Guestbook. If you would like an E-Mail sent to you when either this page is Updated or Your Favorite Railroad Is Updated Please Sign The Guestbook. I am in the process of scanning photos from my archives and also from recent trips. Thank YOU for your patience and Please join us again. 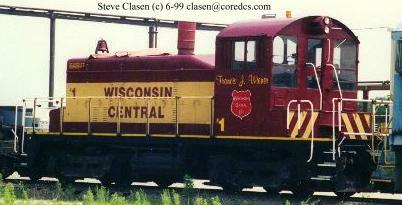 WC 7638 is one of the newest Wisconsin Central Paint schemes taken February at the yard in Stevens Point, WI. This unit is now rumored to be in pieces in North Fond Du Lac, WI. All Railroad GIFs by Dan Klitzing. Visit his site, Dan's Depot. for THEIR slides & photos of Wisconsin engines. If you would like to add photos to my site, please send me an E-Mail concerning this. please sign The Guestbook or register with groups.yahoo.com below. Please ask permission before copying photos and Safe Railfanning!! sharing these photos, please tell me what you think. Also, the thumbnails or, option of enlargement of photos by clicking on the engine, works on ALL photos. Thank you for your continued patience and added comments and ideas. Please send me any comments, questions, or ideas!! logo= New Photos added to this page! logo= Better Quality Photos added to this page! logo=Under Construction or Coming Soon! To receive updates, or railfan news around midwest. I suggest signing up for this free e-mail list.